I couldn’t exactly remember where I first caught wind of the DEVO book being prepped for publication this year, but records show I signed up for “more information” on the Rocket 88 publications website over two years ago. 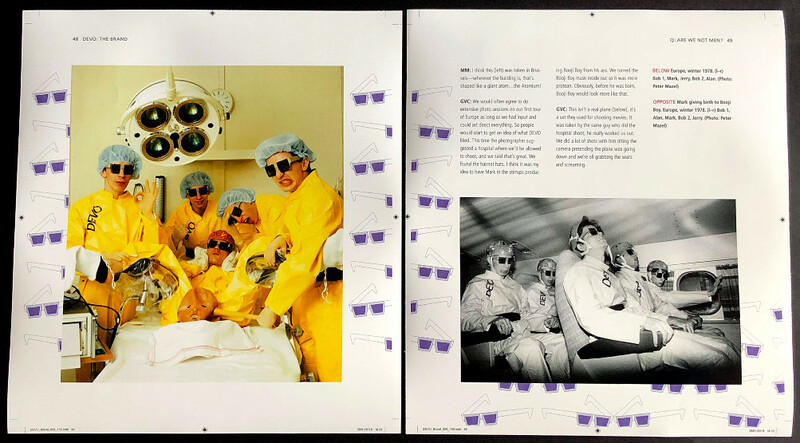 Last week, the details were finally forthcoming and the DEVO coffee table book of your dreams as written by the band [read: most likely Mothersbaugh + Casale] is coming… some time this year. 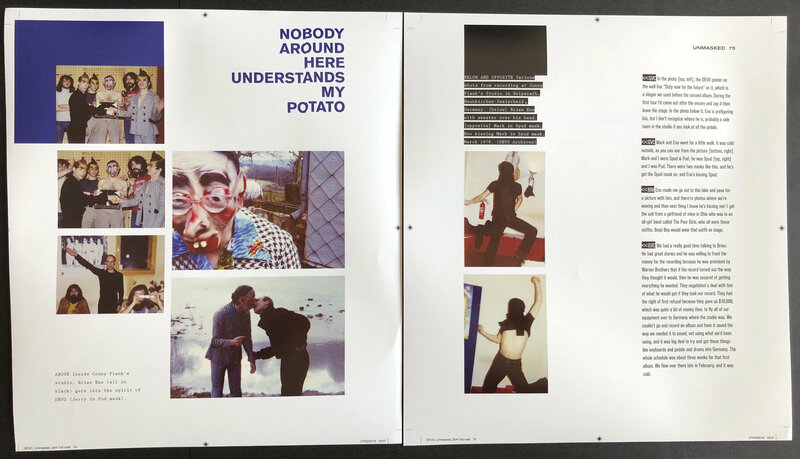 The book has been in pre-order status since last Friday and heads up: anyone who would like to have their name printed in the book by pre-ordering has until midnight tonight, GMT, to have that honor. And right now there’s about six hours left for that little perk. 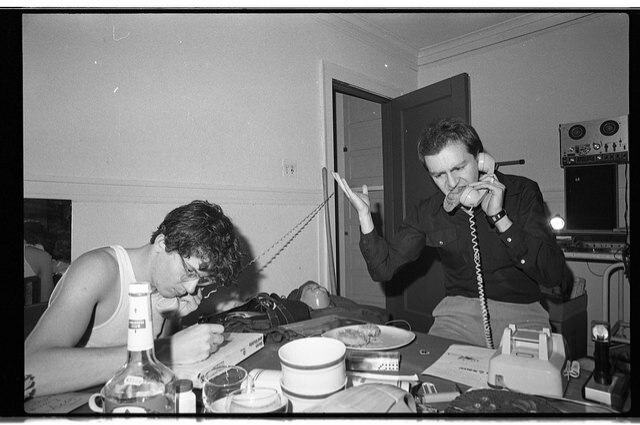 Standard edition will be a unique “topsy-turvy” book with 320 large format pages; 160 pages comprised of “DEVO: The Brand” and the other 160 pages [which are flipped 180 degrees] comprised of “DEVO Unmasked.” It’s got over 500 images throughout culled from the DEVO archives. Given that their arresting visual design was always equal to their groundbreaking sonics, this should be one to savor – at least, if one is attuned to their decidedly pungent satirical aesthetic. I know that I certainly am and have been for 40 years. The book will be printed on heavy art stock with a rubberized cover. Buyers of this edition will pay £50/$65. Certainly within the sweet spot for me. I was hoping that this would not be a $300+ elitist tome and it’s not…technically. That doesn’t mean that they are not also making one of those. The Signature edition differs in its physical characteristics will be two separate 160 page hardcovers in a slipcase, embossed with the logo from “Duty Now For The Future” on it. All editorial content is otherwise identical, but there are trinkets added to further differentiate this edition. Price for that one is what I was afraid of up front: £250/$330 but at least that’s not our only option, and for that I give thanks. 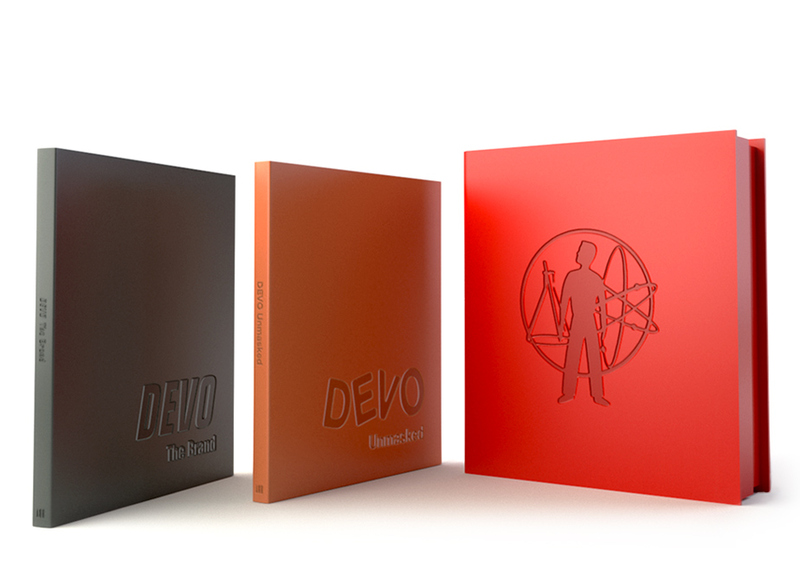 There are many bands I would gladly pony up $50-75 for a coffee table book detailing their history and DEVO is certainly solidly within that camp. Pre-order is still underway even after midnight tonight, so we have an unspecified window in which to act. 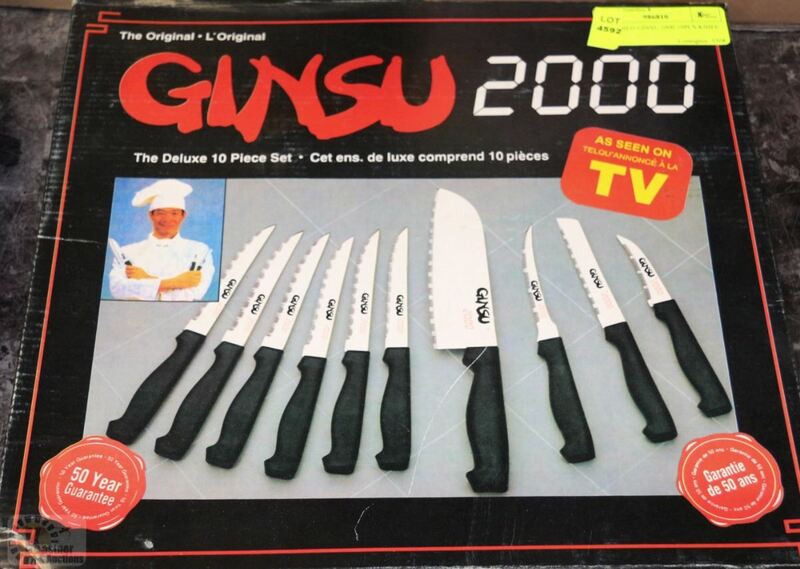 But remember: order before midnight tonight and get your name in the book…along with this fabulous set of Ginsu Knives®! The book is only on sale at the Rocket88 DEVO book microsite. This entry was posted in Core Collection, Want List and tagged 2018, Book, DEVO. Bookmark the permalink. Thanks for the heads up on this. Does it have to be ordered though a specific site or will it hit Amazon? I have no interest in having my name in the book however the $65 edition, well steep, I gotta say I am inclined to buy. If the text is anything like the audio commentary on their video collection this is going to be a fun read. Tim – If you click through to the microsite, they have a helpful FAQ. Reading between the lines, the book may be discounted somewhere down the line via third party Amazonians, but no promises. Otherwise, it will only be available at the Rocket 88 store. Helpful hint: “Spud15” nets your a 15% discount in pre-order. I really appreciate your help with all of this, sadly, right now i can’t do it. My youngest son, who has ASD, broke his tablet on Saturday night and I had to do an emergency Best Buy run for a replacement. This thing is his one stop shop for entertainment, books, games, media, all of it is consumed through one thing. It was a $200 expense that I didn’t expect right on top of replacing my old and konking out laptop (notice the rapid decrease in typos? Yeah I’m not working on a wonky keyboard anymore). So unless there’s a PPM community kickstarter I’m out of contention on this one until sometime in May. Thanks Monk, the discount was the final push I needed! So yeah. Now we’re old enough to dive into sweet memories…. As I already have the ‘We Are DEVO’ Book and this is rather expensive I will miss out on this – as much as I like the early Records up to (and including) ‘New Traditionalists’ and some of the newer ones like ‘E-Z Listening Disc’ and ‘Something Else For Everybody’. Still it looks very promising and I hope you’ll enjoy it. I have scans of the Jocko Homo pamphlet, which I am figuring have to show up in the new book that this post is about. See SAF Publishing, first hardback edition in 2003, first paperback in 2008 – by Jade Dellinger and David Giffels. Of course this was supported but is not by DEVO themselves..